In the eyes of many, liberalism requires the aggressive secularization of social institutions, especially public media and public schools. The unfortunate result is that many Americans have become alienated from the liberal tradition because they believe it threatens their most sacred forms of life. This was not always the case: in American history, the relation between liberalism and religion has often been one of mutual respect and support. 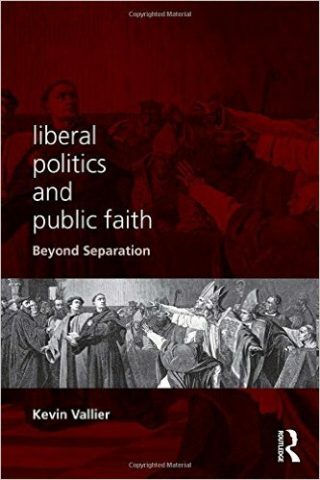 In Liberal Politics and Public Faith: Beyond Separation, Kevin Vallier attempts to reestablish mutual respect by developing a liberal political theory that avoids the standard liberal hostility to religious voices in public life. He claims that the dominant form of academic liberalism, public reason liberalism, is far friendlier to religious influences in public life than either its proponents or detractors suppose. The best interpretation of public reason, convergence liberalism, rejects the much-derided “privatization” of religious belief, instead viewing religious contributions to politics as a resource for liberal political institutions. Many books reject privatization, Liberal Politics and Public Faith: Beyond Separation is unique in doing so on liberal grounds.